A year ago Flynn Cormac and Jubilee Chase made the now-infamous Avon Broadcast, calling on the galaxy to witness LaRoux Industries' corruption. A year before that, Tarver Merendsen and Lilac LaRoux were the only survivors of the Icarus shipwreck, forced to live a double live after their rescue. Gideon Marchant is an underworld hacker known as the Knave of Hearts, ready to climb and abseil his way past the best security measures on the planet to expose LRI's atrocities. Sofia Quinn, charming con artist, can work her way onto any stronghold without missing a beat. When a foiled attempt to infiltrate LRI Headquarters forces them into a fragile alliance, it's impossible to know who's playing whom - and whether they can ever learn to trust each other. With their lives, loves, and loyalties at stake, only by joining forces with the Icarus survivors and Avon's protectors do they stand a chance of taking down the most powerful corporation in the galaxy - before LRI's secrets destroy them all. 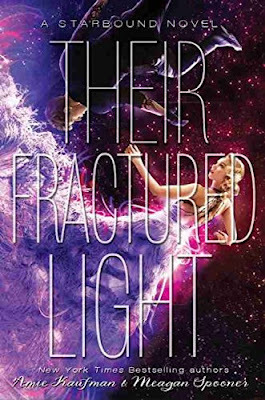 I fell in love with this series when I read These Broken Stars last year so This Fractured Light was a book I couldn't wait to start reading. I've just had so much fun reading this trilogy, I love the epic scope of it, the way events unfold across such vast distances and how one man has managed to cause so much complete and utter mayhem throughout the universe. The first half of this novel focuses on our new couple Gideon and Sofia. We've actually met both of these characters before (Gideon is the earth based hacker who helped Flynn and Jubilee make the Avon broadcast and Sofia is the friend who helped Flynn when he needed a place to hide) but it was really great to get to know them better. Sofia escaped Avon during the previous book and she's now on earth working hard to find a way to bring down LaRoux Industries who she blames for the atrocities carried out on Avon that caused the death of her father. Gideon has is own reasons for bringing down LRI and is equally determined to achieve his goal. The two cross paths when they're both making separate attempts to infiltrate the LRI headquarters and circumstances force them to work together to make their escape. They've never met before and have no reason to trust each other now so their reluctant alliance doesn't last long but when Sofia's cover is blown and she is in desperate need of help she has nobody else to turn to. I really enjoyed the push and pull between these two, they're united because they have a common enemy but they don't know enough about each other to have full trust and it takes a long time for them to open up and start sharing their secrets. I don't think I loved them quite as much as the previous characters but I did think they made a really cute couple and they're both extremely brave and focused on their goals which was admirable. In the second half of the book they meet up with the couples from the previous books and this is where things really kick off on the action front. Don't get me wrong, there was plenty going on in the first half too, but when all 3 couples get together they finally start putting enough of the pieces together to have a chance at bringing down LRI once and for all. I don't want to say too much about what happens but Lilac's father isn't going to give up on his goals without a fight and our group of friends aren't going to have an easy time of it. We also get to see snippets from the Whisper's POV and I found it really interesting looking at humanity through the lens of beings so completely other. Overall this has been a fantastic trilogy and it's certainly one I'll reread in the future. Amie Kaufman and Meagan Spooner did a brilliant job of tying all the loose threads together and creating an incredibly satisfying ending. I'm going to miss these characters but I'm glad they went out on such a high note and I'll be keeping an eye out for more books from both of these authors in the future.